Studies in ecology of the geological past are of a great importance for evolutionary biology, palaeogeography, palaeoclimatology, etc., as well for ecology itself. Modern biology treats organic evolution as a significantly adaptive, and thus ecological, process. Phylogeny can be reconstructed and formally described on the basis of comparative anatomy but it cannot be interpreted in causal terms without constructing of adaptive, i.e. ecological, scenarios. Often the reconstructed phylogenetic pattern cannot be clarified without recourse to history of other taxa. In fact, the ecological context of phylogenetic processes is much more substantive for their accurate interpretation than postulated geographical isolation which is the only extrinsic factor routinely (and often, perhaps, inaccurately) analysed in the majority of modern phylogenetic scenarios. Different members of the same taxon may differ considerably in ecology. In this case their phylogenesis is managed by very different environmental factors, and its resulting adaptive pattern in each of the phylogenetically related but ecologically dissimilar lineages may be similar with those in other taxa, phylogenetically unrelated but ecologically similar. It is self-evident that in respect of the leading evolutionary challenges and selective forces evolution of the predacious aquatic beetles has much less in common with the evolution of the terrestrial herbivorous beetles than with the evolution of the odonatans or aquatic bugs. If an adaptation to the abiotic environments is a one-sided process, the biotic interactions result in complicated co-evolutionary phenomena because in this case the adaptation is mutual. Even when the models of highly specific, strictly reciprocal long-term co-evolution in two ecologically connected lineages are often criticised, the so-called diffuse co-evolution (Janzen 1980) involving various multispecific interactions, both direct and indirect, is certainly widespread and important. It should be stressed that in the strongly co-evolutionary interdependent taxa (e.g. in a specialised predator/prey or pollinator/plant system) the co-evolution may be sufficiently inadaptive, with a rapid and very narrow mutual specialisation destroying the previous adaptive compromise system (after Rasnitsyn 1987); in this case the extinction of both hyperspecialised lineages becomes highly probable. Any causal analysis of phylogeny might take co-evolution into account. An important special case of diffuse co-evolution which is often neglected is the phenomenon of the adaptive value revisiting by natural selection (Zherikhin 1978; Zherikhin & Rasnitsyn 1980) when an important novelty in one lineage stimulates evolution in similar direction in many other taxa, mostly through competitive interactions but sometimes in other ways. The members of the same community are always at least somewhat coadapted, and the community is controlling and managing their evolution in different aspects. The palaeontological record shows that biological evolution is remarkably uneven in space and time both in respects of its rate and directions. As a rule, the changes are relatively slow, gradual and channeled towards increasing specialisation within the same principal niches but there are much shorter episodes when they become rapid and drastic (the coherent and incoherent evolution type, respectively, after Krassilov 1969). It is hypothesised that the coherent evolution is under a strong community control while the incoherent processes indicate that this time the coadapted community system has been destroyed (Krassilov 1969; Zherikhin 1979, 1987, 1993b). Palaeoecological considerations are based mainly on indirect evidences and often started from ecology of present-day taxa. This direct actualistic approach is the simplest one but rather risky in many cases. Many evolutionary lineages either are completely extinct or include few modern relicts which may well be ecologically exceptional, and the functional morphology of insects is not very well-developed leaving adaptive interpretation of too many structures equivocal. As a result, ecological evolutionary scenarios are highly speculative. To test them Nel (1997) proposed a formal method of probablistic analysis of the distribution of ecological and other unknown characters in a cladogram. He illustrated his method by the example of biology of the termite family Mastotermitidae (see Fig. 378). The only living species, Mastotermes darwiniensis Froggatt, inhabits the woodlands of tropical North Australia, and fossil mastotermitids are often considered as indicators of hot climate (see Nel & Paicheler 1993). However, cladistic analysis has led Nel to the conclusion that there is no good basis for such suggestion even when fossils are assigned to the genus Mastotermes. In fact it means that we can say nothing about past climatic preference of mastotermitids. The palaeontological record itself provides another, and in fact the only reliable possibility of testing palaeoecological hypotheses. The direct evidences such as food remains in fossilised gut content or coprolites, pollen grains on insect bodies, or plant parasites attached to the host-plant remains, are uncommon. However, there are diverse sources of indirect palaeoecological information including morphological adaptations available on fossil remains, their constant presence in association with other fossils, lithological and sedimentological features of fossiliferous rocks, pattern of fossil distribution within stratigraphic sequences and on broader geographic scale, etc. Both positive and negative data on fossil distribution are significant. For instance, regarding the above-mentioned example of the mastotermitids, an analysis of distribution of their fossils shows that at least in the Tertiary they have to be thermophilous independently from their cladistic affinities with modern M. darwiniensis because their finds are restricted to warm (at least subtropical) climatic areas while other termite families (Hodotermitidae, Termopsidae, Kalotermitidae, Rhinotermitidae) penetrated much more far to temperate regions. In this case distribution of fossils is in agreement with actualistic hypothesis. The snakeflies provide a different example. At present this order is best represented in temperate forest areas and penetrates to subtropical regions mainly along mountains; low temperature (about or below 0є C) is necessary for normal development (Aspöck 1998). On the contrary, the Mesozoic snakeflies (see Fig. 239) are much more common and diverse in warmer Euro-Chinese than in the temperate Siberian Realm suggesting that extinct Mesozoic families differed in the climatic preference from the modern Raphidiidae and Inocelliidae. The palaeoecological importance of trace fossils should not be underestimated, too; in fact, ichnological information is often crucial for testing palaeoecological hypotheses as discussed in more detail in Chapter 2.3. Taphonomic analysis [1.4.2] of reliability and robustness of palaeontological data is absolutely necessary to avoid serious misinterpretations. In this respect the importance of detailed sedimentological and quantitative data on fossil assemblages has to be stressed; unfortunately, this information has never been published for too many insect sites including some most important Lagerstaetten, and the documentation of many museum collections is not detailed enough. Some ideas about possible ecology of fossil insects are scattered in the old palaeoentomological literature, and speculative scenarios of ecological evolution became popular in biology after Darwin and Haeckel. However, for a long time the palaeontological data were used in such scenarios only occasionally, at least in entomology. Panfilov (1967) was the first author who made an attempt to outline a brief general ecological history of insects. His analysis was based nearly entirely on actualistic interpretation of the fossil record of different taxa; many of his conclusions now considered inconsistent but others have been supported by more recent and diverse set of evidence. Zherikhin (1980a) gave more detailed review, but rapid progress in insect palaeoecology in the last decades makes a new synthesis necessary. An important difficulty in this way is that such synthesis cannot be limited with the palaeoentomological information but needs the critical analysis of a huge amount of other palaeontological and sedimentological data as well. The best and most recent attempt of such analysis by Behrensmeyer et al. (1992) is used here as a general frame for environmental context of the insect evolution. The following is not more than a preliminary outline of the present-day data on the world scale, and more detailed comprehensive analysis is still a matter of future. Early insect history is nearly undocumented. None of the arthropods known from the Palaeozoic could be interpreted as representing probable ancestral lineage for the insects. A pair of dicondylous mandibles named Rhyniognatha praecursor Tillyard has been described from the Early Devonian (Siegenian, 394 to 401 My) Rhynie Chert in Scotland where other arthropods including mites and springtails have been found as well (Tillyard 1928). This unique remain may indicate the first insect appearance in the fossil record but it can be doubted for two reasons. Firstly, it may well belong to a different mandibulate arthropod most of which have their mandibles dicondylous (Kluge 1996). Secondly, the alleged find of a tubuliferous thrips nymph in the same deposit indicates a possibility of a much younger (probably Tertiary) contaminants in the chert (Crowson 1985; but see Greenslade 1988). Rhynie is one of the most important Lagerstaetten of the non-marine Devonian biota, and the absence of unequivocal insect finds here seems to be significant. The Rhynie fossils are preserved in permineralised peat-like matter and represent likely the fauna of semiaqautic vegetation episodically affected by hot spring waters rich in silica (Kühne & Schlüter 1985). In the younger Early Devonian (Early Emsian, 390 to 392 My) Battery Point Formation at Gaspe in Quebec, Canada, the head and thorax of a bristletail Gaspea palaeoentognathae Labandeira, Beall et Hueber has been found (Labandeira et al. 1988). The remain was found in a clayey layer within fluvial sequence. Another supposed bristletail fragment was discovered together with diverse other terrestrial arthropods (scorpions, pseudoscorpions, mites, trigonotarbids, spiders, centipedes) in the Late Devonian (Givetian, 376 to 379 My) deltaic Panther Mountain Formation at Gilboa in New York, U.S.A. (Shear et al. 1984). It should be noted that all these Devonian finds occur in some exceptional taphonomical conditions in association with other extremely rare fossils. Another important thing is that all of them are restricted to Atlantic North America and West Europe which that time have constituted a single continent placed within the equatorial belt. 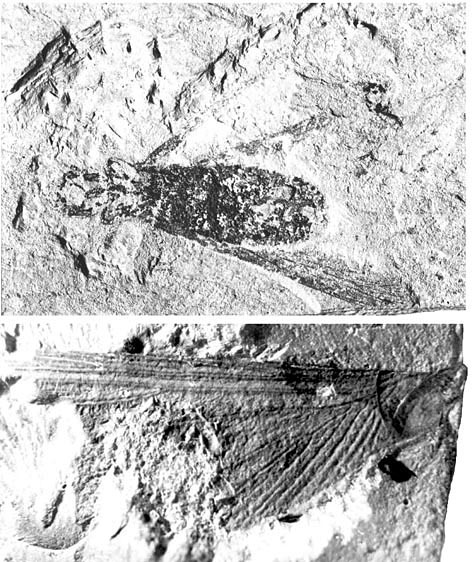 The genera Eopteron Rohdendorf and Eopteridium Rohdendorf originally described as the primitive winged insects from the Late Devonian of Russia and Ukraine are found belonging to Crustacea (Rohdendorf 1972). A number of the pre-Carboniferous trace fossils are attributed to the non-marine arthropods (e.g. H. Schmidt 1938, P. Kevan et al. 1975, Pollard et al. 1982, Pollard & Walker 1984, Rolfe 1985, Sherwood-Pike et Gray 1985, Hotton et al. 1996, Buatois et al. 1998) but none of them is interpreted with any certainty as made by an insect. In the Early Carboniferous insects still remain virtually absent in the fossil record. Schram (1973) mentioned a "Rochdalia-like insect" from the shallow-marine Visean (333 to 349 My) deposits of Glencartholm in Scotland without any description or illustrations of the fossil. This record is most probably a misidentification (Rasnitsyn, pers. comm.). According to Brauckmann et al. 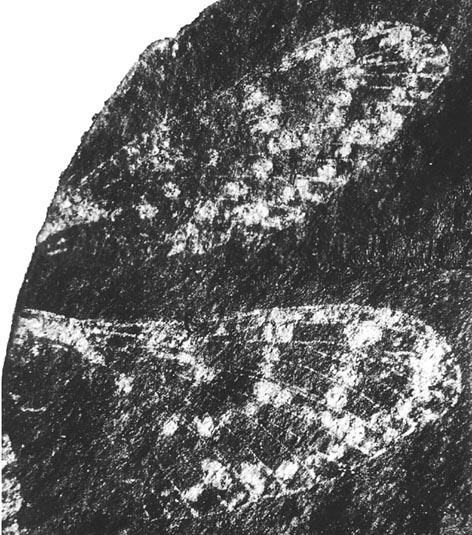 (1996), the only unequivocally known Early Carboniferous insect is Delitzschala bitterfeldensis Brauckmann et Schneider from the very end of the Early Carboniferous of Germany (early part of Namurian A, Arnsbergian Stage, 320 to 322 My). Morphologically Delitzschala is a typical member of the order Dictyopterida (see Fig. 136), and there is a good basis to consider this group as specialised plant-suckers inhabited mainly tree crowns. In the Carboniferous, Bitterfeld was situated within the tropical belt. 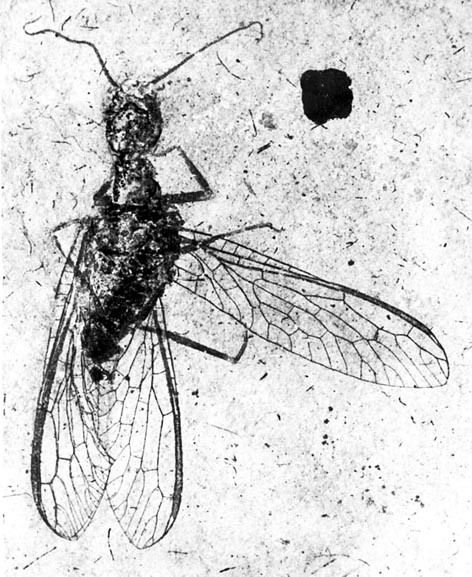 Thus few points about early insects are certain at present: that they already existed in the Early Devonian; that they are extremely poorly represented in the fossil record and restricted to exceptional preservation contexts; that they are not found outside the equatorial areas; that the winged insects have originated no later than in the latest Early Carboniferous; and that the earliest winged insect known was likely a plant-sucker. The very scarcity of the early insect record is ecologically significant, especially if rather high diversity of other Palaeozoic non-marine arthropods is taken into account. It permits to reject any possibility of primarily marine or lacustrine insect habits because the animals with well-developed external skeleton have a high preservation potential in such environments. The oldest insects have to dwell certain taphonomically strongly unfavourable habitats, i. e. strict terrestrial, running-water, or tidal. This palaeontologically cryptic stage of evolution has to be rather long, covering not only early evolution of the insects themselves but also of their immediate ancestors. None of the above three possibilities can be excluded definitively at present; however, the running-water hypothesis seems to be the least, and the terrestrial scenario the most plausible. Indeed, the watercourse environment is highly specific in many respects, and its inhabitants usually demonstrate a number of peculiar morphological adaptations. The probability of their burial decreases with increasing current speed but also the morphological specialisation increases in fast-running waters. No primitive insects, either extinct or extant, that are known to show any features that could be regarded as having been inherited from a specialised rheophilous ancestor. There are few well-documented examples of the rheophilous insects that have secondarily developed a terrestrial mode of life (e.g. some gripopterygid stoneflies). However, in these cases the derived descendants of aquatic lineages retain significant morphological features of their aquatic ancestors; they are in fact semiaquatic rather than truly terrestrial animals. Thus running-water communities seem to be highly conservative and their composition changed very slowly in the geological time; so the probability of complete extinction of a diverse rheophilous lineage without leaving any derived aquatic descendants is low. A tidal hypothesis is more difficult to test because many inhabitants of the littoral flotsam are morphologically similar to terrestrial forms and some of them probably gave rise to true terrestrial lineages in a way virtually undocumented palaeontologically (e.g. in isopod crustaceans: Cloudsley-Thompson 1988). A tidal scenario was discussed recently for the insects by Tshernyshev (1990, 1997). The most reliable way for testing of this hypothesis palaeontologically seems to be ichnological studies because diverse trace fossil are not rare in littoral palaeoenvironments. At present, the available information is not enough for any definite conclusion. Tshernyshev supposes that the bristletail springing could originally be an adaptation allowing to escape wave action like in the present-day littoral amphipod crustaceans. This specialised mode of locomotion is likely a derived one in the wingless insects, and crawling like in the silverfish was most probably plesiomorphic. The terrestrial hypothesis of the insect origin seems to be the most plausible. It is in accordance with the palaeontological data and in particular with the presence of other terrestrial organisms in all Devonian fossil assemblages containing insects; it does not suggest rapid extinction of ancestral insect lineages still in the Palaeozoic; and it does not require any hypothetical ancestral specialisation left no evident traces in the organisation of any known primitive insects. As supposed by Ghilyarov (1949, 1956), the most probable habitat of ancestral insects was wet litter or soil; both are highly unfavourable taphonomically. Not so long ago it seemed that the Devonian land was still weakly colonised by organisms. However, large and rapidly growing body of data accumulated in the last decades indicates that by the time of the first insect appearance in the fossil record the terrestrial life was diverse (for reviews see Shear & Kukalová-Peck 1990; DiMichele & Hook 1992; Edwards & Selden 1993). The following principal milestones of the early terrestrial life record are worthy of mention here to outline the ecological context of insect origin and early evolution. The oldest tentative evidence of any terrestrial life is the presence of primitive palaeosols supposedly affected by subaerial microbial activity in some Praecambrian sequences with the absolute age up to 3 billion years (Retallack et al. 1984; Retallack 1990b). More developed palaeosols are discovered in the Late Ordovician, and the burrows in the latest Ordovician (about 440 My) palaeosol of Pennsylvania constructed supposedly by earthworms or myriapods constitute the oldest putative evidence of terrestrial Metazoa (Retallack & Feakes 1987). Another important evidence of progress in terrestrial communities is appearance of the plant spores resistant to desiccation in the Late Ordovician and Early Silurian (Gray 1985; W. Taylor 1995). The trackways of myriapod-like creatures are also discovered in the Late Ordovician (about 440 My) of England (E. Johnson et al. 1994). The Mid- to Late Silurian record provides evidence of progress in terrestrial ecosystem organisation. Terrestrial plant radiation is documented by increasing diversity of spore types (Gray 1985), by plant macrofossils (Edwards & Fanning 1985; Edwards & Selden 1993), and by better developed palaeosols with alleged rhizome traces (Retallack 1990b). The first appearance of undoubted vascular plants is the most important Late Silurian event (Kevan et al. 1975). The tentative ascomycete hyphae and spores of supposedly terrestrial fungi (Sherwood-Pike & Gray 1985; Taylor & Taylor 1997), and the oldest fossils representing undoubted arachnids and myriapods (Edwards & Selden 1993) have been discovered in the Late Silurian. The vegetation was patchy, with denser cover along stream channels (DiMichele & Hook 1992). It should be stressed that all supposedly terrestrial invertebrates found in the Late Silurian were likely predators; this suggests existence of an unknown detritivore and/or grazer fauna (DiMichele & Hook 1992) which could include among others also early insects or their ancestors. In the Early and Middle Devonian the terrestrial plants were rather diverse. Several major groups of vascular plants were appearing, namely the zosterophylls, trimerophytes, horneophytes, barynophytes and lycopsids (Meyen 1987a), and more ancient plant lineages still survived including the primitive rhynians related to the Silurian genera, and even the hepatic-like producers of the primitive spore types known since the Ordovician (D. Edwards et al. 1995). This suggests that the older ecosystems probably has not disappeared but existed perhaps as initial successional stages in more complicated successional systems. The lichens are also found (T. Taylor et al. 1997), and the discovery of arbuscules in Aglaophyton documents complex interactions between arbuscular endomycorrhizal fungi and rhynian plants (Taylor & Taylor 1997). However, the local plant diversity was low: even in the polytopic assemblages no more than 10 to 15 plant genera are represented, and normally only 1 to 5 species occur together (DiMichele & Hook 1992). This vegetation still occupied mainly wetlands and areas along streams while watershed areas were probably barren or nearly so. However, Retallack (1981a, 1990b) points that there are less evidence of soil development interruption by clastic sedimentation than in older palaeosols suggesting that the stabilising effect of vegetation has somewhat increased in comparison with the Silurian. The terrestrial animals were represented there mainly by arachnid and myriapod-like arthropods. Taxonomy and palaeoecology of early myriapods are disputable; in particular, their terrestriality as well as their alleged relations to Diplopoda may be questioned in many cases (Almond 1985). Like in the Silurian, the oryctocoenoses were numerically dominated by predators suggesting that the original community structure is inadequately portrayed by fossils (Kevan et al. 1975; Shear & Kukalová-Peck 1990; DiMichele & Hook 1992). Trace fossils support this idea. In Rhynie plant remains demonstrate occasionally traumatic tissues and other injuries caused rather by biological than by physical agents (Kevan et al. 1975). Some of the pathologies are tentatively interpreted as connected with secondary fungal infection. Similar injuries were discovered on trimerophytes in the Battery Point Formation in Canada (Banks 1981; Banks & Colthart 1993). The trauma makers are unknown. The mites from Rhynie were rather predators or fungivores than herbivores (Edwards & Selden 1993), and the springtails belong to Entomobryioidea, the superfamily including no plant feeders (Greenslade & Whalley 1986). Kevan et al. (1975) supposed that trigonotarbids could be at least facultative sap-suckers or spore-eaters but this hypothesis has been rejected by later authors (Rolfe 1985; Shear et al. 1987; Shear & Kukalová-Peck 1990; Edwards & Selden 1993). Rather large (5 to 12 mm long) arthropod coprolites containing plant cuticles were found in the Battery Point Formation as well; they were tentatively attributed to detritivorous millipedes (Hotton et al. 1996) but in fact there is no firm basis for any attribution at present. Smaller Early Devonian coprolites from Wales contain spores, sometimes damaged (Edwards & Selden 1993). Some morphological structures of Devonian plants are tentatively interpreted as protective against herbivores (Kevan et al. 1975). In the Late Devonian and Early Carboniferous there were further important changes in the terrestrial ecosystems. Like in the Early and Mid-Devonian, new community types appeared in addition to those previously existed (most probably as later stages of successions) rather than replacing them totally. As a result the structural complexity of terrestrial ecosystem increased considerably without significant extinction of earlier types. The most obvious Late Devonian novelties were the appearance of tall plants forming true forest vegetation (with the trunk diameter reaching 1 meter in progymnosperm Archaeopteris) and the oldest terrestrial vertebrates (DiMichele & Hook 1992). The forest vegetation was probably restricted to waterlogged soils along streams and on wet floodplains. Both novelties were probably stimulated partly by the progressive development of terrestrial arthropod fauna and reciprocally affect its evolution. As concerning the origin of trees, Kevan et al. (1975) speculate that besides plant competition for light the spore-feeding arthropods could stimulate an elevation of sporangia high above the earth surface. The forest communities with increased litter production provided a valuable food source for terrestrial invertebrates, thus allowing considerable increase of their abundance and biomass. It is well known that living plant tissues except reproductive parts are generally poor in nitrogen, and that detritivory on dead plant matter already processed by fungi and bacteria suggests less trophic specialisation than the herbivory. Thus the early terrestrial invertebrates should be predominantly opportunistic detrite-feeders. The role of terrestrial arthropods and other invertebrates as the key food resource allowing the terrestrialisation of vertebrates is evident, and perhaps increasing availability of this resource in the Late Devonian forest floor facilitated this process significantly. On the other hand, the vertebrate predation on land surface could stimulate arthropods moving to tree crowns. The effect was increasing desiccation resistance as well as adaptation to feeding on plant reproductive organs, the only resource of a high nutritive value available for non-predacious animals outside the area of high predation risk. The probability of burial of non-flying crown-dwellers should be very low, even less than for the litter inhabitants in riverine gallery forests. Surely, there were also others protective strategies against vertebrate predation such as cryptic mode of life in the litter and soil, increasing body size (for instance in the Arthropleurida, an extinct myriapod lineage represented by small-sized forms in the Early Devonian but giants in the Carboniferous), development of spines on the body, etc. Myriapods and arachnids rather well represented in the Early Carboniferous deposits demonstrate diversity in the presumed protective adaptations. An important evidence of using food substrate as a shelter is the presence of rather large tunnels in an enigmatic Devonian organism Prototaxites, perhaps belonging to an extinct lineage of fungi, in the Late Devonian Kettle Point Formation of Canada (Hotton et al. 1996). The tunnels contain coprolites with fungal remains and were constructed likely in the lifetime of the host. The tunnel maker is unknown and probably represented an extinct mycophagous arthropod lineage. Other noteworthy Late Devonian and Early Carboniferous events were an expansion of seed plants (the oldest fossil assemblages dominated by seed plants have been discovered in the latest Devonian of Ireland: DiMichele & Hook 1992); progressive development of heterospory (accompanied probably with increasing in nutritive value of sporangia: Kevan et al. 1975); first appearance of the fully terrestrial vertebrates, including the earliest amniotes, in the Visean (the East Kirkton fauna in Scotland: DiMichele & Hook 1992); and progressive geographic differentiation of non-marine biotas. There is no evidence for significant biogeographic differences in land floras before the latest Devonian, but in the Early Carboniferous the differentiation was well established between the Eurameria, Angara and Gondwanaland regions (Meyen 1987a). In particular, the forest vegetation was well developed in Eurameria but not in Angaraland where no plants with large pycnoxylic stumps are known since the Late Famennian up to at least the Late Namurian (Meyen 1987a). The basic ecological differentiation of plant assemblages, with the lepidophyte-dominated ones in the coal-bearing deposits of wetlands (the anthracophilous flora) and the fern- and pterydophyte-dominated assemblages in coal-less deposits accumulated in drained environments (the anthracophobous flora), is typical of the Middle and Late Carboniferous and has been fully established by the Late Tournaisian (DiMichele & Hook 1992). Meyen (1987a) pointed out that the first appearance of inland coal-bearing deposits in the Tournaisian may indicate an increase in antierosional effect of slope vegetation which has reduced the transport of clastic material to the lowlands. The absence of insect finds in the Early Carboniferous (except its latest part with the first albeit advanced pterygotans) suggests that the pterygotan ancestors continued to evolve in a taphonomically unfavourable environment. The most plausible environment for this most important evolution event over the whole history of insects seem to be tree crowns. The probability of burial of non-flying tree-dwelling arthropods in sedimentary rocks is extremely low even in a near-water forest, but after acquiring of flight it should increase significantly. In the very end of the Early Carboniferous winged insects are entering to the fossil record and then continuously present as fossils in diverse sedimentary environments. Shear & Kukalová-Peck (1990) postulate that the main radiation of winged insects must occur well before and that their sudden appearance in the fossil record has to be explained by increasing preservation opportunities in extensive swamps developed in the Late Carboniferous landscapes. However, if this hypothesis is correct, it is difficult to explain why the winged insects have appeared in the fossil record as late as in the Namurian and not in the Tournaisian. Moreover, the insect fossils are in fact far from being restricted to swamp palaeoenvironments, and it is difficult to suggest a long-time cryptic existence of winged insects if they did not inhabit originally watershed habitats distant from any water bodies. As discussed below, the frequency of their finds is not constant in the Middle and Late Carboniferous when swampy forest environments were constantly widespread but increases continuously since its beginning, and this pattern indicates a significant ecological expansion and diversification of insects from the Namurian to the latest Carboniferous. It should be stressed also that the recently proposed model of flight origin from aquatic gliding (Marden & Kramer 1994, Marden 1995, Ruffieux et al. 1998), theoretically elegant and welcomed by some authorities, has no support by any palaeontological data; moreover, it is in an obvious controversy with the fact that their origin is undocumented by the palaeontological record. Hence the following speculative scenario of the early insect evolution looks most plausible in the light of the recent palaeontological data. The insects originated in terrestrial environments from a terrestrial ancestor not later than in the Late Silurian or the Earliest Devonian. Up to the Late Devonian they constitute no more than a rare and perhaps weakly radiated group of small-sized myriapods, probably mainly detritivorous, inhabiting low vegetation and litter and restricted to terrestrial habitats. In the Late Devonian they diverged into two main ecological lineages. One retained plesiomorphic feeding (detritivory) and evolved as forest floor inhabitants; there were no ecological prerequisites for development of flight in this lineage. Another line has colonised tree crowns and evolved there as spore-feeders. The sporangia provided valuable (especially after appearance of the heterospory: Kevan et al. 1975) but sporadically distributed resource. Seeds constituted another important food resource which became more and more important in the course of expansion of seed plants, the more so that plesiomorphic gymanosperm seeds placed on leafless axes and free of any covering fruit structures were easily available for seed predators. A progressive development of hard seed coats and sclerotic tissues in pollen organs during the Early Carboniferous is in accordance with the hypothesis of arthropod consumption (DiMichele & Hook 1992). The search for food and perhaps also escaping predators (if some predatory arthropods followed the insects to tree crowns) stimulated locomotory evolution from crawling to jumping, with the lateral segmentary flaps acquired to help the attitude control while jumping from one tree branch to another (Rasnitsyn 1976, 1980). Those lateral projections could become moveable still before the origin of true flight. The absence of similar locomotory adaptations in any recent tree dwellers is not a serious argument against this model because they could be effective only in absence of any highly active flying predators. It should be stressed that this ecological scenario is compatible with any hypothesis of the wing homology. In particular, it did not exclude the serial homology between the wings and the abdominal gills (tergaliae) of the mayfly nymphs as supposed by Kukalová-Peck (1983) and Kluge (1989) but suggests that the gill function has to be secondary. The ancestral pterygote lineage was probably restricted to the equatorial belt of Euramerian land mass.